It was true. Arts makers and arts lovers really did take over Wirksworth on the first weekend of this town’s rural arts festival in September 2013. Shop windows filled with contemporary arts and craftsworks, even the local fish and chip shop; the churches too. Dozens of locals offered their houses, gardens and sheds as galleries and willingly allowed artists to fill their walls, shelves and floor spaces with foreign objects, and let complete strangers to wander through their inner sanctums. The Town Hall and Memorial Hall became makers’ markets where some of the region’s finest artisans exhibited and sold their wares. Instant cafes with hand-written menus offering teas, coffees, juices and home-baked delights sprouted up in private gardens and kitchens. Pop-ups stalls selling old books and comics, retro-clothes and other treasures appeared in front yards and on the streets. Musicians drew mini-crowds at street corners and in the squares and gardens. Other performers, including two provocative female cleaners, astonished, shocked, and delighted passers-by in myriad ways. And, from time to time, the sun even shone on these festivities. What was happening in Wirksworth on that first festival weekend was far in excess of the capacity any single person to experience the entire program in full, of course, especially since many of the Arts & Architecture Trail gallery and performance spaces were in centuries-old cottages up a quasi-vertical maze of cobbled streets, lanes and pathways, which tested not only festival-goers feet and knee joints, but their hearts and lungs as well. Your scribe was very grateful for the pop-up cafés in locals’ gardens where she could enjoy a quiet sit-down and a cuppa when the walking became too tough! I’m in Wirksworth as part of a cultural exchange between Derbyshire and Central Western New South Wales co-hosted by Arts OutWest, Derbyshire County Council and the Wirksworth Festival. I’m here both as a writer seeking inspiration and British collaborators for future projects, and as a rural arts festival co-organiser looking for ideas for our Kalari-Lachlan River Arts Festival back home in Forbes. The Wirksworth festival has been going for twenty-five years while we held our first biennial River Arts Festival in 2011 and are now preparing for our second in October 2013. Given the Wirksworth crew’s long experience, they have much to teach us. Their festival has reinvigorated this country town and enriched local people’s lives in ways I hope we can replicate in Forbes. One of Harrie Fasher’s steel horses and some of Lanny Mackenzie’s fibre works inside Arts & Architecture Trail venue No. 55, The Saddler’s Cottage, in Wirksworth. Our two towns – Forbes and Wirksworth – are similar in many ways and yet very different. They are both inland rural communities with farming and mining histories. They are around the same size. Their landscapes have both been occupied by humans for some 40,000 – 50,000 years. (I’ll tell you about this in a future post.) They are both now relatively ethnically homogeneous, as in very “white” and English-speaking, and locals in both places share recent ancestors because so many Midlanders migrated to Australia during and after the convict era. Both towns have experienced mining booms followed by economic declines, and farmers and small business people in both regions have often struggled to survive economically: indeed, many still do. Young people in both towns have to leave the district for higher education and to find work, and many never return. Both towns harbour significant pockets of unemployment, poverty and social disadvantage. And neither town has a purpose-built art gallery or cultural centre, yet each manages to host an inspirational arts festival. Physically Forbes and Wirksworth could hardly be more different, however. Forbes is on a flat inland riverine plain which stretches off to a distant horizon, while Wirksworth is tucked into a narrow valley, or dale, with steep hilly slopes. Forbes is watered by a big brown meandering river, the Kalari-Lachlan, which disappears into an ephemeral wetland called the Great Cumbung Swamp, while Wirksworth’s primary waterway, the Ecclesbourne, is swift, clear, English postcard pretty and more of a creek than a river. It runs into the famous Derwent River. Early visitors to Venue No. 42 up Greenhill on Wirksworth’s Arts & Architecture Trail, 2013. The countryside around Forbes is brown, dry and hot for much of the year and the vegetation predominantly evergreen: Wirksworth’s fields are green all the year around except after winter snow falls, and its trees are nearly all deciduous, so look like dead skeletons in winter compared with our eucalypts and acacias. Forbes is in Australia’s sparsely populated rural inland and more than an hour’s drive from the nearest town of over 50,000 people, while Wirksworth, although also an inland settlement, is very close to many other towns and cities, including Derby, Nottingham, Sheffield and Manchester, and just 140 miles (225 kilometres) from London, the biggest, most voracious town of all. The political differences are also significant: although similarly ethnically homogeneous, a majority of Wirksworth’s inhabitants tend to be liberal, or politically progressive, even traditionally leftist (a legacy of the town’s mining history), while in Forbes most locals are politically very conservative. Notwithstanding these differences we Australian guests in Wirksworth are drawing many lessons and much inspiration from this rural arts festival. Already we are developing strong collaborative relationships with local practitioners and festival organisers. But I’ll tell you about some of these in future posts. Young Derbyshire photographer George Peck gives you a glimpse of the 2013 Wirksworth Festival in this video. Wirksworth, Derbyshire, “the navel of England”, as DH Lawrence called it. Visiting choristers and uke players give an impromptu performance in Wirksworth’s Market Place. Ukuleles in Wirksworth’s Market Place at dusk. Exhibition venue and jumble sale on Wirksworth’s Arts & Architecture Trail, 7 September 2013. Buskers in a town square, as viewed from Wirksworth’s Heritage Centre in an old silk mill. 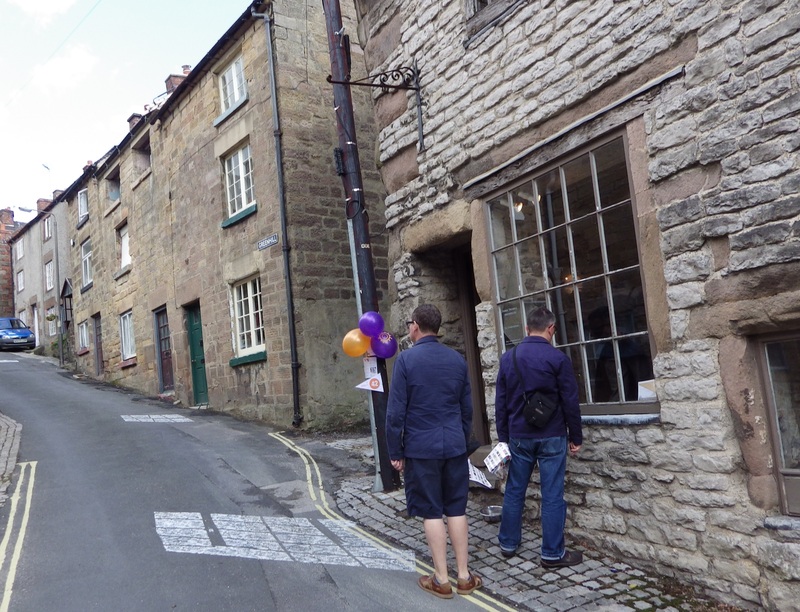 More early starters on Wirksworth’s Arts & Architecture Trail. Street Art on the Arts Trails. Wirksworth’s West Derbyshire United Reformed Church’s choir stalls transformed into exhibition space. Wirksworth’s Baptist Church’s exhibition of traditional quilts. A local kitchen up Greenhill is opened as a Festival cafe serving home cooked cakes and tea on the terrace. A private garden becomes a sculpture gallery. Commissioned artwork-in-progress, Forced Landscape by Rachel Champion, at Wirksworth’s National Stone Centre. An exhibition and cafe in Wirksworth’s Baptist church. Hay bale seating and home-made bunting in the town centre. Down a narrow lane, a private garden becomes a quiet haven for tired arts lovers. Coffee stalls and pop-up stalls in Wirksworth’s main street. Well marked festival bus stops from which arts lovers can catch the community bus to and from parking stations and venues. Performance by Australian theatre arts group, Lingua Franca, within Katherine Vaugan and Greg Storrar’s installation, The Blacksmith’s Depositree, in the blacksmith’s workshop. Installation in a garage, one of my favourite works at the Festival. Triangular chipboard installation in Wirksworth’s main street used to promote Festival gigs. Festival Office in North End. Visitors discover a window exhibition on the Arts & Architecture Trail. Amnesty International stall in a back garden off the main street. Tubular bells up a hilly path. A young trumpeter busks for charity near the Australian lodgings. This entry was posted in Derbyshire, Midlands, rural arts festivals, Wirksworth and tagged community cultural development, Derbyshire, rural arts festivals, rural communities, Wirksworth. Bookmark the permalink. Many thanks, Alastair. 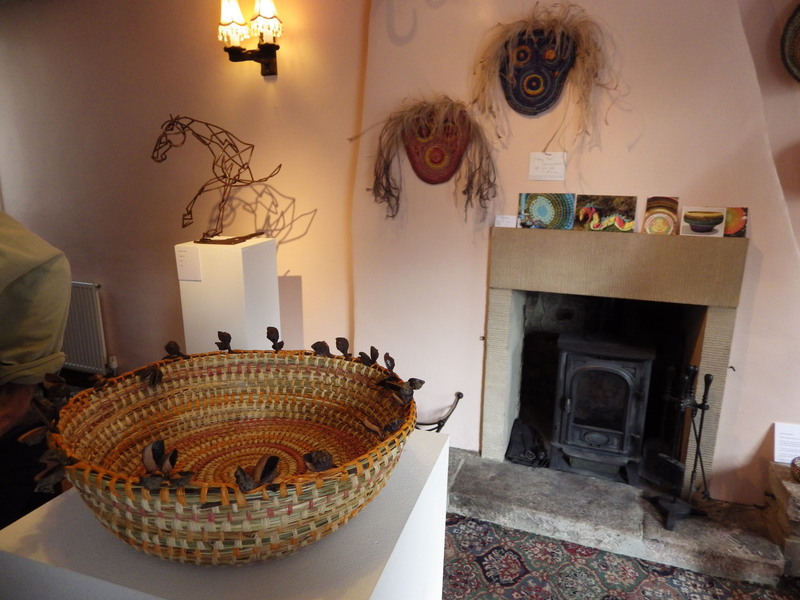 It is a great privilege for me to have an opportunity to visit Wirksworth and to experience your wonderful Festival. Thank you for the Die connection. Just to add that it was stunning Aussie Double Act show last night with the Lingua Franca movement piece and Kim Deacon’s harp playing, singing and story telling.
. Ashamed to say I’d never heard of the Australian writer Henry Lawson nor his mother who launched that feminist magazine ‘The Dawn’ . Just goes to show that by hanging around in the woods you meet people who ‘learn ye stuff’. You can look forward to a post about our Aussie Double Bill sometime soon, with interviews with each of the performers about their works. They truly did us proud last night! Hi. As a local I too strongly agree it is fantastic to have such a clear and professionallyl written article on the proceedings of this years Wirksworth festival. I can only trust it will come to the attention of the organisers of wirksworth festival and perhaps local papers and tourist board will promote the use of the sight and utilise quotes from this article. Best wishes from Laura in the opticians Wirksworth.